Parma Number 22: The Normanby Hotel … No Alfie Langer like celebration here! The Verdict: I have to confess at the outset that I have never been much of a fan of the Normanby Hotel. It is has just not been a venue that I have enjoyed in the past. I was hoping that the Chicken Parmigiana, which was described in the menu as “the real deal” would change all of that. Unfortunately, this was not a Parma that left me dancing on the tables in celebration! Chicken: The chicken portion on this Parma was one of the highlights of the dish. It was well crumbed and perfectly cooked. My only criticism of the chicken is that some of the outer crumb shell had been burnt during the process of melting the cheese. Tomato Sauce: The sauce on this week’s Parma was a Napoli sauce and was definitely a very nice tasting sauce. The problem was though, as I would also find in another key element of the meal, that there was just not enough of it! A very thin covering of sauce which, in a places, had not covered the chicken piece completely was just not enough. Ham: The ham presented exactly the same issue as the tomato sauce. It was very tasty but there was just not enough of it! In concert with the lack of tomato sauce this meant that some of the forkfuls of chicken I ate were only complemented with melted cheese alone. Cheese: I can not fault the cheese on this dish and, frankly, I am well placed to judge it given that it overwhelmed the Ham and Tomato Sauce in volume. It was well melted and tasted great! 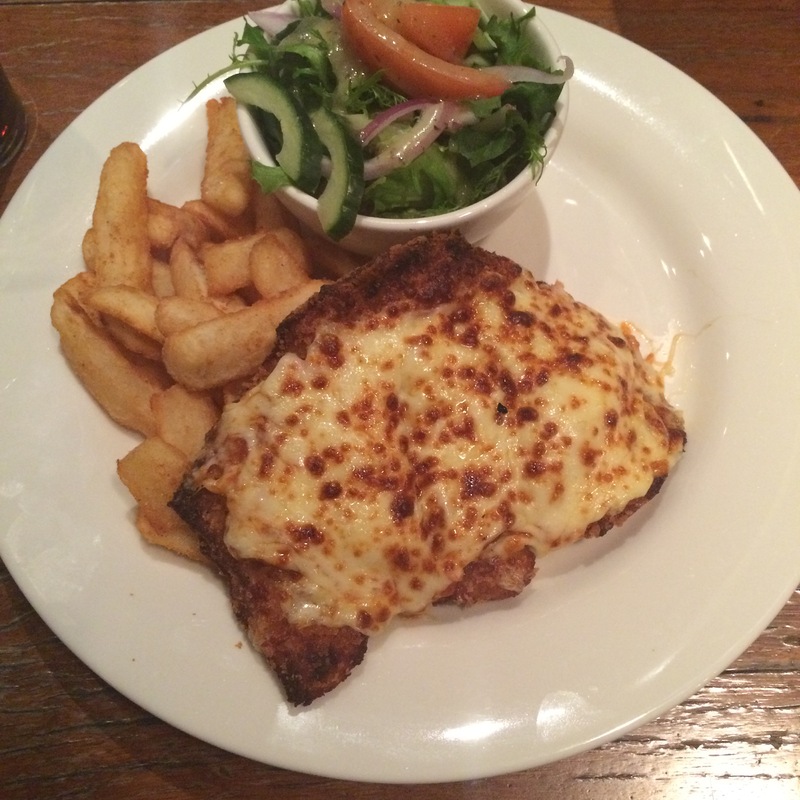 Side Dishes: As disappointing as the lack of Ham and Tomato Sauce was the quality of the chips and salad on this Chicken Parma went some way to rest that disappointment away. The chips were wonderfully well cooked and perfectly salted. I could not fault them. The salad was fresh, well dressed and just enough to compliment the meal well. Presentation: I will say it again … Why have a big enough plate to serve all of the elements of this dish easily and then plonk part of the chicken on top of the chips? It just makes no sense to me. The Venue: The Normanby Hotel is a Brisbane icon. Built in 1889 and now Heritage Listed it possesses 5 bars along with a spacious dining area. The carpark is regularly used as a venue for watching sport on the big screen. My chicken parmagiana cost $25.50. The Final Word: This was a chicken parmigiana that presented with much promise and had many great elements but was let down by the scarcity of two of those elements. I definitely was not left feeling in the mood emulate Allan Langer’s dance on the bar in celebration of this Parma, rather I was left ruing what might have been but for the lack of ham and sauce. This entry was posted in Uncategorized and tagged allan langer, Brisbane, brisbane eats, brisbane food, chicken, chicken parmigiana, Normanby Hotel. Bookmark the permalink. 2 Responses to Parma Number 22: The Normanby Hotel … No Alfie Langer like celebration here! As a former chef, I can tell you exactly why people keep putting the chicken on top of the chips and it makes perfect sense. Presentation. Putting it on the chips lifts it and gives it height, making the dish look overall better to the eye than having it flat on the plate, looking like something you dish up at home. This has been going on forever and will continue to happen as long as there are cooks out there who know what they are doing. Thank you for your two cents. I get that it is about presentation. It doesn’t mean that I have to like it or agree with it. Of the 22 Parmas I have tried so far the ones that have consistently stood out are those that have not been on top of the chips. This is all about personal preference and mine is to not have the chicken on the chips. I am sure many disagree with me and that is ok: that is a personal choice! Thanks for reading and commenting mate!